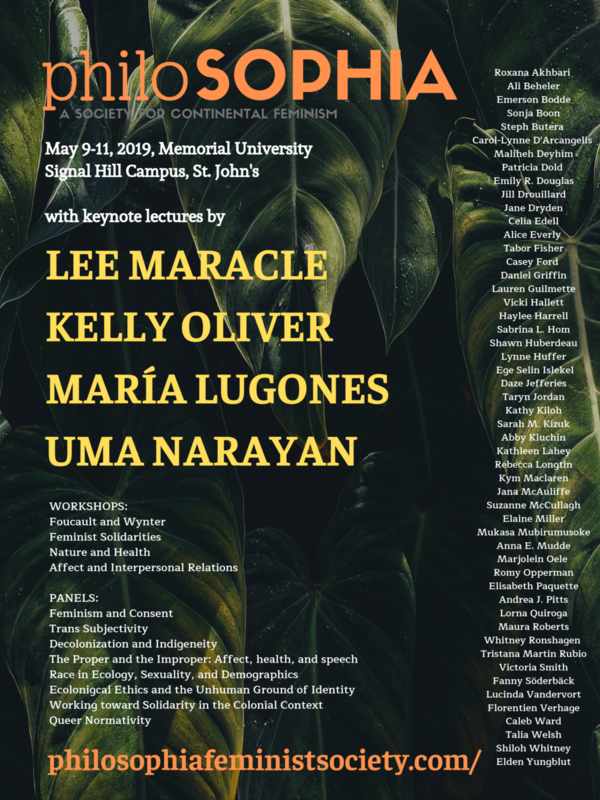 The 13th annual meeting of philoSOPHIA will run from the evening of Thursday, May 9, to the evening of Saturday, May 11, 2019, at Memorial University’s Signal Hill Campus in beautiful St. John’s, Newfoundland. Keynote speakers are María Lugones (Binghamton), Uma Narayan (Vassar), Kelly Oliver (Vanderbilt), and Lee Maracle (Toronto). Conference registration coming in early April! 1:15 PM – 3:30 PM Lunch (provided). Guided walk up Signal Hill. philoSOPHIA is honored to participate in the second Diverse Lineages of Existentialism conference, which will take place June 3-5, 2019 at George Washington University in Washington, D.C. The society will host two panels of three papers each. We are particularly interested in papers that, while engaging continental philosophical and feminist themes, highlight the society's commitment to diversity along the axes of gender, race, ethnicity, sexuality, ability, class, and citizenship. Note that philoSOPHIA is also hosting its annual conference in May 2018; submission or presentation of a philoSOPHIA panel at DLE II does not exclude applicants from simultaneously submitting their paper to the philoSOPHIA annual conference. Submissions will be reviewed by the Executive Committee. With several thousand unique views per year, philosophiafeministsociety.com has to potential to provide a good amount of exposure for feminist artists and their works. To that end, philoSOPHIA invites the submission of original artwork, imagery, and/or photography for use on its website, CFP announcements, promotional flyers, and conference materials (programs, posters, etc.). We particularly encourage the submission of works that visually speak to the overall themes and figures endemic to feminist thought and the mission of the society. Please only submit works that are your own or to which you hold the copyright. philoSOPHIA cannot afford to pay for the use of these works, but you will be credited and we will provide a link to your wider work. Please prepare your work(s) as digital image(s) in .jpg, .png, or .gif format with a file size between 500KB and 10MB. Provide the artist's full name, a short bio, title(s) of the work(s), and a link to any external site where additional work resides. philoSOPHIA will contact you regarding your submission before use. Our use does not imply any transfer of copyright. The work may have appeared elsewhere, as long as the previous publication does not prohibit its further use. You can also find us on Facebook under the group name, "philoSOPHIA - society for continental feminism".